I am sure we all have watched at least one or two videos of people successfully performing parkour stunts (or failing miserably). It’s fascinating what the human body can do once one puts forth the effort to learn new things. However, I have always gotten my personal parkour fix vicariously through games such as Mirror’s Edge or the Prince of Persia series. I was pleasantly surprised to discover another game that could potentially fill my need to pull off dangerous stunts, without the chance of reaping painful consequences. This aforementioned game is called Time Crash ($2.99) by 8SEC. Time Crash is a first-person runner that places you in the shoes of an agile protagonist who has to save a futuristic city by fixing time itself. The story is told through a minimally animated series of comic panels. These cut-scenes are spread periodically throughout the 15 levels of the single player portion of the game. It’s nothing complicated but it’s enough to understand why you are recklessly traversing through numerous buildings and cityscapes. The controls of the game consist of tapping or sliding your finger on the right side of the screen to avoid obstacles by sliding, vaulting, zip-lining, jumping, swinging, and wall-running through each level. The controls are responsive and almost every one of my deaths felt like they were solely my fault. The game does an amazing job of helping you learn its mechanics through short tutorials that appear before levels. It slowly builds new mechanics on top of previously learned ones until you are busting out strings of ridiculous maneuvers with relative ease. Eventually the game introduces you to a “time break" ability that you can utilize by pressing your finger and holding it down on the left side of the screen. This causes you to be able to avoid tears/rips in time. I really enjoyed juggling the task of having to successfully traverse each level with my right finger, while also having to make sure I safely passed through the copious amounts of “time traps" with my left finger. I don’t want to spoil any more actions that you can utilize further down the road, but I can assure you that these mechanics definitely tested my ability to multitask, while also giving the gameplay a more unique flavor. The designs of each level are varied and I really enjoyed their verticality. One second you may be on a roof top and the next second you could be on the ground. It really makes the parkour feel impactful and progressive. You are also shown how far you have left to run until you reach the end of the level. This led me to experience some clutch moments (soaked in tension) as I saw the small amount of meters I had left to go. I found myself having to try certain levels quite a few times until I memorized sections of them in order to proceed. This will probably cause quite a few frustrating moments for some, but it only made successfully completing a level feel very rewarding for me. After finishing the single-player campaign you gain access to daily challenges. I really appreciated this added content and it kept me coming back to the game long after I completed its single player trappings. 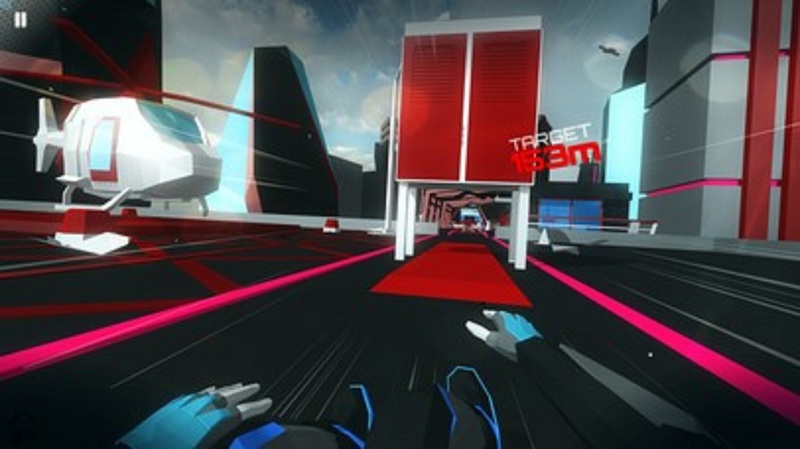 An endless mode is also included to test your ability to run for as long as possible. As you can see, there is quite a bit of end-game content to be had with Time Crash. Unfortunately, I cannot leave out the fact that I encountered a few bugs in some of the single-player levels of the game. Colliding with specific doors caused me to endlessly run against them instead of instantly failing the level. Sometimes I was only able to use my time break ability, regardless of which side of the screen I touched. I also found myself accessing areas of levels that I shouldn’t have been able to access. Additionally, I discovered that my battery would drain quickly while I played. Fortunately, there is a battery-saving option in the game’s settings that you can use to avoid this. We can’t deny that it would be quite drab to be continually running through bland environments, no matter how good the parkour moves are. 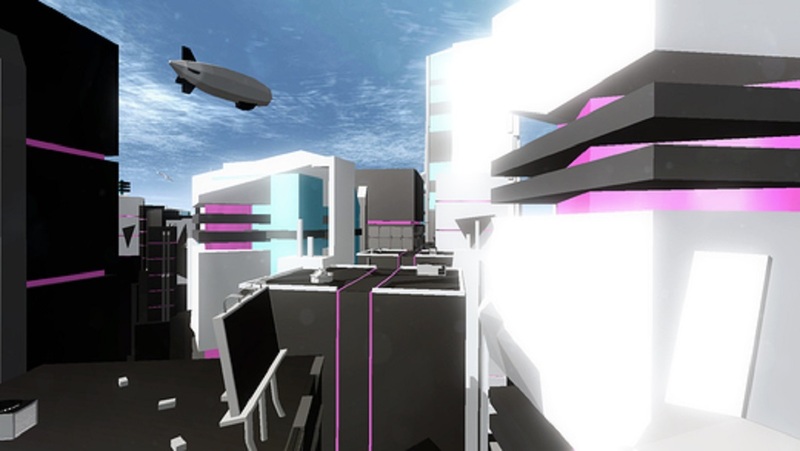 Luckily, Time Crash sports low-poly environments drenched in vibrant “Tron-esque" colors. I found that this art style (specifically its color pallet) really helped me differentiate obstacles from the environment. It’s simple, yet beautiful. I also appreciated the visual diversity of each level. All the various obstacles remain relatively the same, but their color schemes and residual environmental designs made each level feel different and unique enough to keep me interested. It’s interesting to note that you can also customize your character’s appearance depending on how much of the game you have completed. The aesthetics are complimented well by a techno soundtrack consisting of 14 different songs by various artists. You can change the tracks at any moment during the game in real-time, as well as when you are in the menus. I found myself listening to the game’s soundtrack with headphones to further improve my immersion within the game, instead of listening to my own tunes. All in all, I was pleasantly surprised with how much I enjoyed Time Crash, despite its few hiccups. The single-player levels provided serious challenge and diversity, while the daily challenges and endless mode kept me coming back for more. It’s also beautiful to look at and has a unique combination of visual (and gameplay) styles that set it apart just enough from other games in the genre. If you enjoy runners, you should definitely give this one a look. It stole my time while I was simultaneously saving time within the game. Simply put, it’s a good price for a good game. If you need more impressions on Time Crash, check out other people’s opinions in our forum and feel free to leave impressions of your own!